This post is in response to an anonymous reader who requested for a special feature on Tinuy-an Falls in Bislig, Surigao del Sur. While I usually cover Davao Region, particularly the city of Davao which I call home, I am, much to my delight, taking an exception on this one with the hope that the following will satisfy the purpose of said reader's request. The Philippines is much blessed with numerous waterfalls scattered in the different parts of the archipelago, and each Falls has its own beauty and characteristics that makes it unique and a spectacle to wonder. Seven of the highest waterfalls in the country are found in Mindanao; five of which are in Lanao del norte, and two are found in Davao, while the biggest and perhaps the widest falls is found in the city of Bislig in Surigao del Sur, widely known as the "Niagra Falls of the Philippines" - the Tinuy-an Falls - a towering 55-meter (180 feet) waterfalls whose white water curtain, measuring 95 meters (311 feet) at its widest, cascades in four tiers along a multi-layered riverbed of natural formation rocks surrounded with a verdant forest of centuries-old trees, and a rich variety of exotic floras and faunas, ferns, vines and moss. The water catch basin is about 30 feet deep and features three islets amid a swath of rainbow which can be seen between 9 AM to 11 AM. 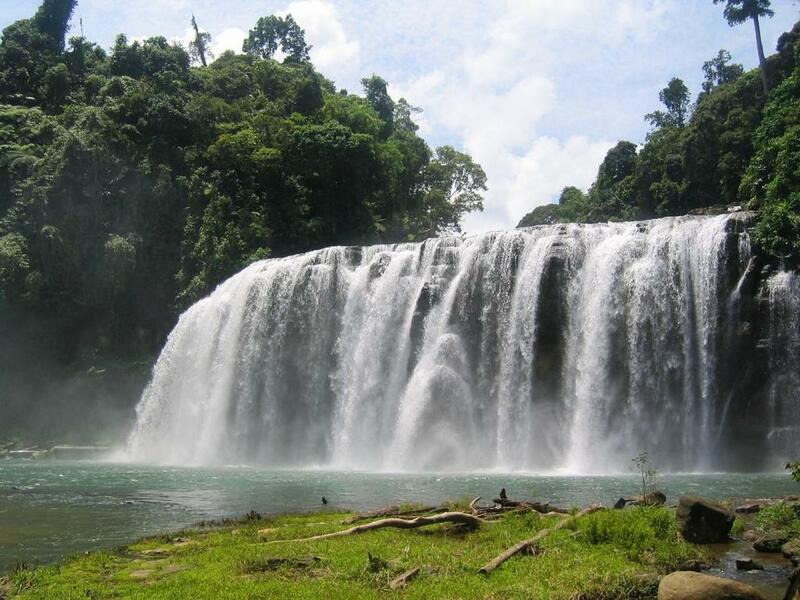 The waterfalls is a widely popular tourist attraction in Surigao del Sur - a province of the Philippines located in the CARAGA region at the eastern coast of Mindanao, bounded in the north by Surigao del Norte, Agusan del Norte and Agusan del Sur to the west, and Davao Oriental to the south, facing the Philippine Sea. It is located in Barangay Burboanan in Bislig - a 3rd class city of Surigao del Sur, Mindanao, and the easternmost city in the Philippines in terms of geographical location. Known as the "Booming City on the Bay," Bislig is approximately 208 kilometers northeast of Davao City, 152 kilometers south of the capital city of Tandag, and 158 southeast of Butuan City. It was once home to the now defunct PICOP Resources, Inc., the largest paper mill not only in Asia but in the world. PICOP permanently closed down its operations in the mid 2008. Bislig can be reached by taking any of the daily scheduled airline flights from Manila or Cebu via Davao City, Butuan City or Surigao City. From the Davao Ecoland Bus Transport Terminal in Davao City, there are regular trips of aircon and non-aircon buses of Bachelor Express that ply daily the 5-hour Davao-Bislig route as early as 2 AM. 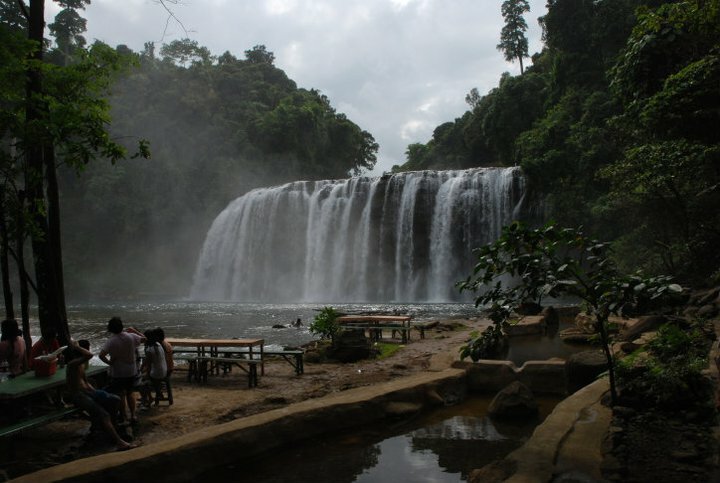 Upon reaching the Mangagoy Integrated Terminal in Bislig, there are numerous jeepneys and habal-habal that go to Barangay Borboanan where the waterfalls is located.